As summer approaches you’ll probably be spending more time outside in the sun—increasing your chances of getting a sunburn. A sunburn can be an unpleasant experience, but fortunately, there are several home remedies that can help with discomfort and pain. That being said, there are others that you should avoid at all costs. Cool baths or showers can take away heat and pain cause by a sunburn. Or, apply a cold compress to the burned skin for 10 to 15 minutes a few times a day. Aloe vera extract, which comes from the aloe vera plant, is great for easing discomfort, soothing skin, and speeding up healing. This gel is one of the best moisturizers to use for treating a sunburn. You can buy many variations of this product at your local drugstore, or if you own a plant, split open a leaf and apply the gel directly to your sunburn. When mixed with bath water, oatmeal works great as an anti-inflammatory sunburn remedy. Grind a cup of oatmeal in a blender or food processor to a fine consistency, then pour the it into a warm bath and soak. White cider vinegar is another bath soak remedy for a sunburn—simply pour 1 cup of vinegar into a cool bath. The acetic acid in the vinegar will help relieve your pain, itching and inflammation. You’re probably used to drinking milk or adding it to your breakfast cereal, but you can also use it to reduce the irritation and heat from a sunburn. Simply soak a washcloth or cotton gauze in cool milk and apply it to your sunburn. Don’t use any home remedies that will trap heat or increase irritation and dryness. Here are some specific remedies that sound reasonable but can actually make your pain worse. It’s actually not a good idea to apply ice to your sunburn. This can constrict the blood vessels beneath your skin, leading to less blood flow and delayed healing. In extreme cases, ice exposure can actually lead to frostbite. There are certain moisturizers you want to avoid—specifically those with “-caine” ingredients, such as benzocaine. 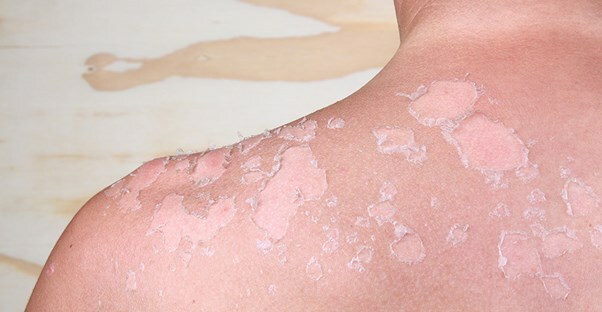 These creams can irritate your skin and cause an allergic reaction. Other moisturizers, like Vaseline, are also a bad idea because the petroleum it contains can trap the heat in your sunburn, causing more dryness and irritation. While taking a cool shower is a good idea, a hot showers is not. Hot showers can increase your pain and further dry out your skin. If blisters develop, although you may be tempted to pop and treat them, you should leave them alone. They form to protect your skin, so breaking them can delay healing and increase your risk of infection. If you’re concerned about blisters, cover them with gauze. If they do pop on their own, clean the area with mild soap and water, apply an antibacterial cream, and cover the area with a wet bandage. How Do You Treat Sunburn Blisters?